There is a lot of advice about washing cloth nappies out there and a fair bit is outdated as vinegar is still mentioned a lot as a softener (great if you don’t mind rotting your bamboo nappies but honestly just don’t do it!). Finding a washing routine that works (and if it results in stinky nappies it’s not working) is definitely an important part of successful cloth nappying for me. 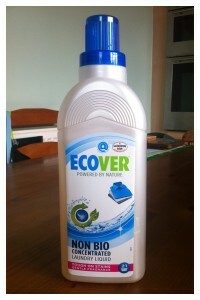 Our current detergent – I don’t exactly know why I chose this one but it’s working well so I’m not changing it! finally the nappies go on a final cold rinse cycle (to make sure that they are thoroughly rinsed of all detergent) at a 1000 rpm spin to get as much water out as possible to save on drying time.